As more and more people decide to lead a vegan lifestyle, it comes as no surprise that vegan restaurants have become quite popular across the world. The times when vegans just had very limited choices to eat out with their friends are up. Nowadays great veggie and vegan places are no longer a rarity in Barcelona either. Whether you’re a vegan, vegetarian or a curious omnivore, don’t miss out on our top ten places below to enjoy delicious vegan food in Barcelona. In recent years Teresa Carles has become one of the hottest vegetarian and vegan restaurants in Barcelona. You can put together your own salad and choose between many delicious appetizers, soups and pasta dishes, meaning Teresa Carles has something for every taste. The stylish eatery also offers a wide selection of fresh juices and smoothies. 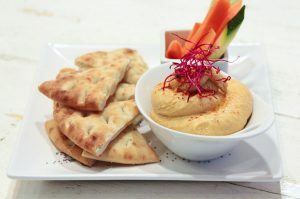 On their Facebook page you will regularly find the latest dishes and daily offers, as well as the dates for their popular live cooking shows, where you can watch the talented chefs preparing your favorite vegan or vegetarian dish. 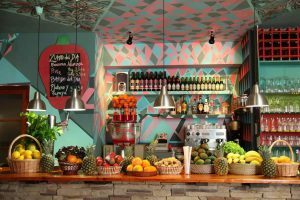 What’s more, there is also a takeaway restaurant/juice bar situated in El Born named Teresa’s where you can grab some yummy vegan goodies and juices for the road! Flax & Kale is a healthy Restaurant for flexitarians, with three different locations in Barcelona: Tallers, Passage and Porter. All of their dishes are designed to please the more health-conscious diner whilst providing delicious flavours. 80% of their menu is plant-based and the remaining 20% are recipes that contain oily fish, meaning nutritional value is certainly at a high when eating here! At Flax & Kale, they are convinced that a proper diet is necessary to maintain a healthy lifestyle, therefore they feel very passionate about feeding their customers high quality dishes in order to live a healthier and happier life. What a great promise! Discover their fascinating world of tasty, healthy, sustainable food at one of their many branches. Veggie Garden is one of the most popular vegetarian/vegan restaurants in Barcelona and it’s easy to see why. In their two locations, the friendly waiters will serve you tasty dishes inspired by Indian and Eastern cuisine. From exotic Thali dishes to vegetable lasagna, you’ll be pleasantly surprised with what their menu has to offer. The interior is very colorful and fun, which makes it a great spot to enjoy a casual dinner with friends and family. Be sure to try their freshly squeezed juices and don’t miss out on their great selection of 100% vegan desserts! Hidden amongst the winding streets of the Gothic Quarter, Rasoterra is a cosy vegetarian bistro ideal to visit at any time of the day. The menu of the restaurant is even attractive for non-vegetarians as it includes delicious homemade dishes based on recipes from all around the world. Additionally, they only use local and organic products, many of which are homegrown. The chilled ambience of this place means you can sit back, relax and embark on a journey of amazing flavours. Located in the heart of Eixample, this restaurant is characterised for being a space that fuses vegan and vegetarian cuisine and gives traditional dishes a new and modern twist. Armonía opened its doors in 2015 and since then, the restaurant has a reputation for using only the best organic foods whilst always respecting the environment. Whether you want to start the day with an energising breakfast or end it in a relaxed and laidback environment enjoying their menu of delicious macrobiotic foods, this is the perfect spot. Armonía is also a great choice to surprise your partner with a romantic dinner accompanied by a bottle of wine and a rich dessert for the finishing touch. 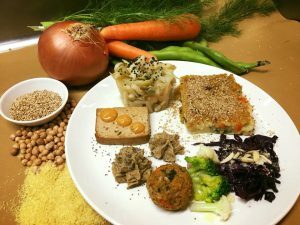 If you want to experience authentic cuisine based on the unique macrobiotic principle, this is the right place for you. 2Y is an interactive space where you can enjoy healthy food prepared with conscience and integrity, from the seed to the finished dish. They only use totally organic and natural products and cook with vitalised sea water for its health benefits. 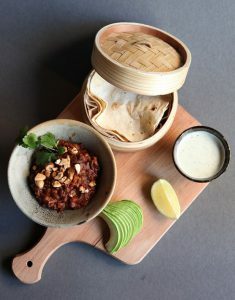 Proteins such as legumes, seitan, tempeh and tofu are accompanied by seasonal vegetables that are prepared in a simple and precise way to preserve the natural flavour. Though the restaurant is a great place for a nice dinner you can also grab a takeaway there, if you don’t want to miss out on their dishes during a busy day of sightseeing. 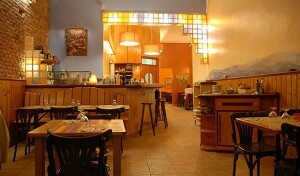 If you still want to maintain a healthy and balanced diet while travelling, then this charming place is perfect for you! Café Santoni prepares the most delicious salads and sandwiches as well as a variety of pizzas, empanadillas and montaditos. Enjoy the great coffee and freshly made vegan pastries. The lunch menu is available for less than 10€ – what a bargain! 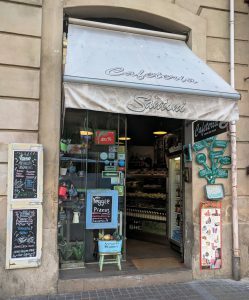 Many delicious snacks and sweet treats await you at this cool café located just around the corner from Plaça Universitat. A great stop you don’t want to miss during your day of sightseeing! Vegetalia opened their first restaurant in Barcelona in 2007, and offer a wide range of high quality products, transforming new and traditional recipes. On the menu you’ll find plenty of deliciously homemade vegetarian and vegan dishes. In 2012 they decided to plant their first organic garden, in order to supply their own restaurants, achieving an even healthier, fresher and more balanced menu. 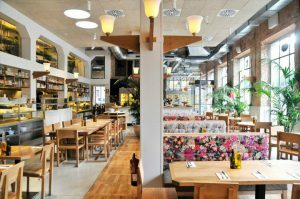 Today Vegetalia has three locations in Barcelona where you can enjoy their natural dishes created with the environment in mind. 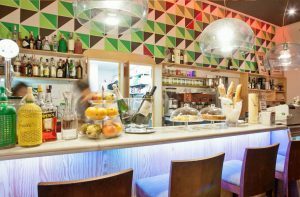 Located in the Eixample district, Amaltea is one of the city’s best-known vegetarian restaurants. Established in 1988, the restaurant offers great value for money and use plenty of organic ingredients. You can get a varied lunch menu for 10.70€ and even on evenings and weekends you can enjoy a three course menu for as little as 15.30€. If you can’t get enough of their delicious dishes check out the cooking classes they offer! The Green Spot is a cosy restaurant with an exceptional atmosphere. The pleasant space is located very close to the Basilica of Santa María del Mar and elegantly decorated with wooden elements and simple furniture. On the menu you’ll find healthy dishes for vegans as well as for non-vegans. The wide range of recipes are carefully prepared as well as being full of excellent, fresh ingredients. 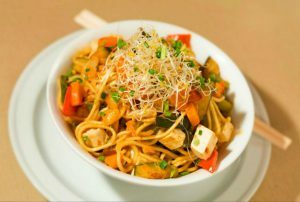 The restaurant offers colourful presentations of salads, soups, rice, pizzas, international dishes, vegetables and many more. In short, an extensive and varied menu from which you can choose what most resembles your taste. Excellent for quiet evenings with a special someone, friends or family!